Operation Thailand: Bali, Amed, Gili Islands and Kuta! A little behind in how Christmas and New Year's was. Mainly because typing with one hand isn't the way I want to live my life. Cast should come off on Saturday, wrist is feeling stronger and excited to get back to a two wrist lifestyle. The night before we left for Bali we had to spend a night in Hat Yai because we were flying out of their around 12ish the next day. Which is great because Hat Yai is our guy's weekend destination with good food and places to go at night. Good food? Check. Staying at a dodgy hotel? Check. Having one of the girls that had the same flight as Arvid and I ruin our next day of travel due to her purchase of a giant ton of non-alcoholic strawberry liquid? Check. Got to the airport the next day, fairly big rainstorm for 30 minutes, apparently long enough to delay us that we missed our connecting flight. Talked with the girl from Air Asia, said it wasn't their fault (shockingly!) and had to buy new tickets. So the girl gives Arvid a price for the new tickets, consults Chelsea and I, said alright, told the Air Asia girl we would like the new tickets, she then scribbles out the first number, then doubles it. Our fair doubled in the span of 30 seconds due to apparent online purchases. Air Asia 1 Red strawberry drink 1 Bert 0. So a few short things about Bali first. 1-Have wanted to go to Bali for a while now but also very aware that having high expectations for anything, especially places is a bad idea. 2-Second biggest reason I wanted to go to Indonesia was to scuba dive. Really into it, haven't been since Similan Island live-a-board and really wanted to do a wreck dive. WELL, we have this roof to thank for no diving for Teacher Bert due to his broken wrist. 3-Main reason I was down for this trip was getting to spend time with Jake, Emma and Kait who I unfortunately don't see as much as before. 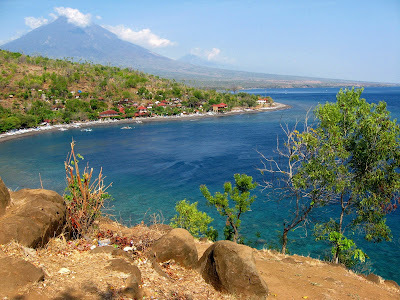 We spent our first few days in Amed. Spent Christmas Eve and Christmas Day there. Had a family villa, Kait got there around 1ish on the 25th, we all opened up Christmas presents, which was amazing. Got a Japanese book from Kait that I devoured quickly and a pretty fancy Japanese headband. Got some clothes and other small things, a very successful Christmas hall in my opinion. Everyone went diving on Christmas Day, I stayed back, read and got a really great Balinese massage. Spending Christmas a second year away from home is a little easier, especially when it is plus 30 degrees outside. Balinese tradition is to eat a babi guling, basically a suckling pig for weddings or special holidays. We drove around trying to find the cheapest guy to roast us a pig along with vegetables and a nice setting. Check, check, check. Our main man Regga hooked us up. Set up at a restaurant that nobody was eating at for most of the night, right on the water. Really good food, some Jim Bean, tequilla and LED Hoops. Then grabbed some fireworks and set them off on the top of a cliff. Great day. After a few days in Amed, we went to the Gily islands. Most accommodations were full but Emma had reserved us a decent place with hot water and breakfast in a big family room. 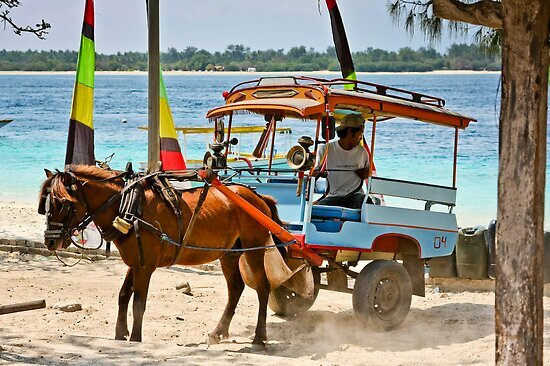 Gily islands were beautiful but they have these little horses carrying passengers and luggage. Kind of sad actually. After researching it a bit, it is a major complaint of tourists and websites and petitions wanting change on the island. it really isn't a great situation. Food was tremendous, eating off the grill, seafood and fresh salad and bread. Was unaware that I love escargots by trying them for the first and second time on this trip. No motorbikes on the island, just horses, bicycles and your feet. My thoughts are that it has classy shopping and restaurants, definitely very touristy with way too many people trying to sell you anything and everything. If their were less of them, it would be way better. Ate a delicious steak New Year's eve, amazing chicken wings that tasted like North America but they also made Arvid and I 20 minutes late to watching The Hobbit but still worth it. The Hobbit was cool by the way, just stoked to watch a movie on a big screen in English. People in Indonesia love fireworks. They are everywhere. People are strolling down the street, talking with their friend then BAMM BAMM BAMM a firework goes off near their feet and people laugh hysterically. It isn't dangerous, just loud and rude. A kid through one at us one night so I kicked it back at him, as it was going off near him he looked at me like "well played". Not a fan of New Year's so my expectations were low. Turned out great. Amazing steak, hung out on the beach for 2 hours talking and watching more fireworks go off in the sky. Hugged and talked our way into a rooftop party where it overlooked all of Kuta, the crowds, the buildings and the fireworks. I was thinking as my mom would say "I am greatly blessed' Being around people you love trumps where you are almost every single time. Even if you are in an incredible place. People over places. We headed out a few hours after midnight to catch our flight, all good on the way back discounting Chelsea getting her yoga mat puke on outside of the airport McDonald's and happy to get back into the swing of things in Thailand. Loved seeing my friends, taking a break from school and just laughing and joking for 12 days straight. Air Asia 1 Strawberry drink 1 Bert-100. TAKE THAT AIR ASIA! !